Independence is vital to the quality of life for every person. For the disabled person, equipment that allows them to transfer themselves from one place to another greatly increases their independence. Transferring equipment for the disabled is also vital for the health and well being of the disabled persons care giver. Within the home, there are many pieces of equipment that aid in the successful executions of daily living. Transferring from bed to wheelchair and back again, can be done with a transfer board or Hoyer lifts. Many insurance companies will help pay for part or all of the cost of durable medical goods. Transfer boards are placed in between two objects like a bed and a wheelchair. For the disabled person with plenty of upper body strength transfer boards are a great option to aid in their mobility. The disabled person simply uses the board to put their body weight on while they slide across from bed to wheelchair. Hoyer lifts is the brand name for a lift that uses a sling and hydraulic power to lift a person’s body up off a resting place, move them and then lower them back to a new resting place. 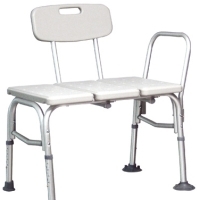 Handicap body lifts such as these do not require the person being lifted to use any body strength to maintain balance or help in the lifting process. For the disabled, bathtub benches make showering much easier because the weight of their body is not lowered down into the tub. They can sit during the showering process, and then transfer out of the shower using a transfer board. Transferring a wheelchair user or a disabled person gives them exercise they would not get otherwise. Persons left in a bed without getting up loose muscle mass and bone strength. Transferring helps the disabled person gain independence, keeping their bodies as strong as possible for as long as possible. Transferring out of bed allows a disabled person to remain a part of society.